It�s good to see the enthusiasm these days for Bax�s Viola sonata � in fact it�s good to see Naxos getting to grips with Bax�s chamber music with such avidity. The historic yardstick was always the Primrose-Cohen 78, now featuring in several CD incarnations, not least because the composer�s own performance with Lionel Tertis was not issued at the time and only surfaced on a Pearl LP. It�s to be heard now both on Pearl and Biddulph CDs. This is all well and good but of course performers today are not necessarily beholden to the past, or to past performance practice. But it�s interesting to contrast such as Martin Outram and Julian Rolton with another fine pairing, the American-Canadian team of Doris Lederer and Jane Coop on Centaur CRC2660. Both Lederer and Outram are violists in well-established quartets. Outram plays in the Maggini, current masters of the British quartet muse, whilst Lederer was part of the unfortunately fractious Audobon. Lederer and Coop play with lean control and eloquence though their tempi and affiliations are reminiscent of the Primrose-Cohen approach. Outram and Rolton have clearly heard the Tertis-Bax recording. Their tempi are brisk, though not as brisk as the volcanic composer and his equally inspired string colleague. Nevertheless the tempi are fast enough to startle; most pairings prefer a more equable and elastic approach. I don�t, so I am entirely sympathetic to the new recording. Shaving two minutes off the Lederer-Coop first movement � just that one movement alone � makes a huge difference to the work, allowing the folkloric elements to burn brightly and with heart stopping intimacy. So does depth of vibrato usage and colour. Outram�s tone is deeper, the vibrato wider than most of his competitors. Even so fine a pairing as Michael Ponder and John Alley on ENS123 must cede here and elsewhere. Whilst it would be good to have a transfer of the Forbes/Cassini account they don�t quite command the full colouristic spectrum as Outram and Rolton do, partly perhaps a recording phenomenon, as Forbes was of course an outstanding player. In terms of tone, balance, evocative projection of the slow finale, and technical security at speed this new release has a great deal to commend it. I wish more pairings would dare to take Bax at face value and drive through this sonata. 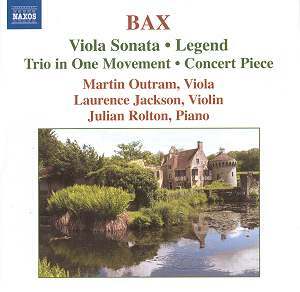 I reject those criticisms that Bax sounds slipshod in his recording and that he and Tertis fail to explore the sonata with sufficient care - not so. The Concert Piece has its share of folk elements. It�s very early Bax, written in 1904 for the composer and Tertis once more. I suspect that that violist would have swept through the lyric nostalgia with rather greater trenchancy but it seems only slightly overlong in this expert performance. In the Legend Outram and Rolton face competition in the shape of Colletti and Howard on Helios CDH 55085, an all-British viola disc. I thoroughly approve of the faster tempo adopted by the Naxos pairing though it must be conceded that Coletti phrases with glorious elegance. His vibrato is faster than Outram�s as well which imparts a greater frisson to his playing. The Trio sees the duo joined by Laurence Jackson, also of the Maggini, who is recording the Bax violin sonatas for Naxos. Though it sits high for the viola, corporate sonority is maintained by these experienced players. Cast in one movement and written in 1906 it sports an open-air feel but isn�t yet distinctively Baxian.� The rhapsodic style encourages some affectionate playing; flirtations with Dvoř�k can be felt here and there as well as with the salon. The best part is the Prestissimo finale, which swings with tremendous vitality. I�d place the Outram-Rolton sonata recording high for its virility and refusal to engage spurious metrical displacements. The Trio is a youthful work but enjoyable and you must have the Legend in your Bax chamber arsenal in whatever recording. As a single disc viola selection you couldn�t do much better than this.